Home » Texas Rangers » A thing called pitching. Mike Minor punches out Shohei Ohtani for the first of seven strikeouts. Minor is now 5-1 with a 2.78 ERA in his last six starts. There’s an old saying in baseball that any night you go to a ballgame there’s a chance to see something that had never been seen before. It happened last night at the Ballpark. Rangers fans witnessed a rare event indeed. Rangers pitcher Mike Minor continued his successful transition from reliever to starter, with five-plus innings of three-hit, seven-strikeout, two-run baseball, for his eleventh win of the season. 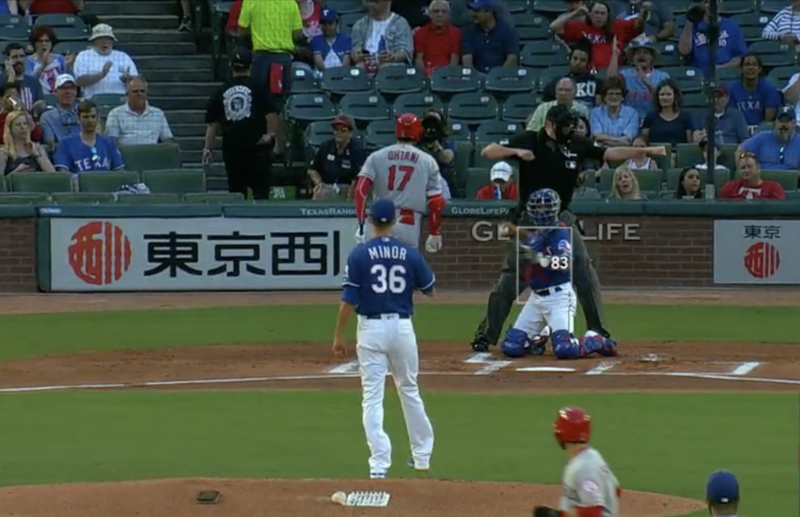 Getting a quicker than deserved exit, Minor watched his bullpen hold down the Angels the last four innings, for a 4-2 win, as the offense contributed home runs from Elvis Andrus and Adrian Beltre, and a two-run double off the bat of Nomar Mazara. The win moved the Rangers to sixth in line for the second wild card, just 21.5 games behind Oakland. Immediately after the stunning victory, the Rangers front office vowed to review tapes of the game and discover what this new phenomenon called pitching is. If other teams in the league have implemented this “pitching,” they have promised to look into it as well and see if they can bring this unique strategy to Arlington. Stand by for further details. Actually, don’t stand by, this may take a while. How the Angels hit against Colon. Thanks, Jake. That means a lot. I have fun doing this. As I indicated above, I wholeheartedly agree with Mr. McCandles. You did a great job of writing with your tongue firmly implanted in your cheek. I love irony…or sarcasm, if you will. You are often very good with it. Today’s article was exceptionally so. This ought to be used in a writing class as an example of classic use of irony. A person has to be careful not to be drinking something when they read your work. If not, they’ll end up snorting whatever up their nose. I can see how aspiration could occur if they were stupid enough to drink AND eat whilst reading one of your classics. This one is a classic. Thank you very much for today and all those other days. I love to write, as you no doubt have guessed. You are a great example for me. Jacob, thanks for saying what I would. Rosy still getting paid to play….called up to the show by Cleveland😄😄miss that smile. Amazing. He just keeps finding a job. Strange that for the most part AL Playoffs are set. Bosox,Cleve,Houston,NYY,Oak….NL wide open. NL West might come down to the last day. Great races. I always try to give them a nice salute. I would never have the cajones to do what they did. Did not work on phone…Ck it out at home. I’m not sure how real that is. It looks made up and the guy looks like he is acting. I know from experience that people are very friendly and exceptionally nice to people when they find out they have served. People are often very giving to my dad when they find out he served for 26 years. One time they let us park for free at the Rangers game because they saw my dad’s military sticker on his car. I have witnessed nothing but nice things. I have never seen anything like that before and I would have personally spoken up myself, had I seen anything like that. I can’t imagine that happening now days. People seem to be pretty thankful to military personnel. I would have been outraged for him. There’s just no way I could have been quiet in a situation like that. Sorry have to disagree…although it has got better…..a wise Scary man once said it was the only silver lining to 9/11……when it hit home people tended to embrace cops,fire fighters,Military more. What the boys had to endure coming home yo the hips,yips of the 60s was a travesty. I know that, Jake. My father-in-law served three tours in Vietnam. I am talking about now. This video was clearly made recently. And yes, a lot of things changed after 911 including how people view the military. I said I can’t image this happening now. I had the same feeling that it might be ‘staged’. Regardless his points were accurate and well stated. The great book (and movie) “We Were Soldiers Once … And Young” is about the battle(s) in the Ia Drang Valley and is a fantastic true story of true valor and brotherhood at both the ‘command’ and ‘grunt’ level. Recommend it to anyone whether usually interested in this type of story or not. It’s truly inspiring. Own it and read it. Scarys 2nd fav Nam movie…..captured the chaos of battle. Movie was fantastic as well. Any you SOBs calls me Grandpa and I will kill you!! The other ‘must read’ VN book IMO is the novel “The Things They Carried” (Tim O’Brien). Touching, sentimental and brutal all at the same time. Will tear your heart out. Ever read Rumor of war? Yep …. also really good. Perfectly snarky, Kevin. I love it! Nice one today Midol! It cracked me up! Heck, Kevin does at least one of these every week. It’s just SOP for him, hilarious and on the mark at the same time. I just found out that the guy behind the Rangers Captain costume has been replaced with a new guy. They said the last guy quit. I did not know this. Bani’s loaded the lineup with hitters tonight since they’ll probably need a buncha runs with Bartolo throwing. What are those good ole boys saying about Tom Herman now. He looked and sounded pretty pathetic at the presser afterward. Same ole, same ole Texas excuses. It’s hard to incent coddled football players and having a QB that loves to just throw the ball up in the air and see who catches it makes it tough to win. But TH luvs Ehlinger and hates Beuchel so it’s going to be another sloooow start at DKR. Dropped our season seats this yr. Son has had the same seats since 1993. The juice just ain’t worth the squeeze anymore. Beltre will homer this game. That low outside pitch has been Adrian’s ‘out’ pitch all yr. Don’t think he’s hit it once. Watch Profar from near Grand Slam to a weak out. He can always prove me wrong though. Not weak necessarily but all that build up for just an out. 40 minute 1st inning to score just 2 runs. At that rate it’ll be a 6 game. Ugh. While there’s little in the way of certainty on the Rangers’ roster at present, Grant notes that veteran righty Edinson Volquez, who signed a two-year minor league contract last year, is progressing well in his rehab from Tommy John surgery and could be on the cusp of facing live hitters. Volquez is expected to vie for a starting job next year alongside Mike Minor and at least one young, internal option. Texas could opt to pursue a veteran piece who could develop into a trade chip this winter…. Sounds like an idea that would be a wash, rinse and repeat of 2017. I reckon it is all about panning enough to find a nugget or two. Seems to me the Rangers are an old, tired organization. I know the ownership hasn’t been around that long and JD is still a young guy and the coaching staff and scouts aren’t a buncha old farts. But they all act like they are. They never change up anything in the way they operate. Should change the name of the team to the Texas Geritols. So is JD going to try and pull a Billy Beane? I’ve already written this game off. And I was right, I said Beltre would homer tonight(after his first AB) And he did his 3rd. 2 1/2 hrs and still 3 innings to go. Think I’ve seen enuf of the Rangers tonight with it 7-2. Yeah, uh that’s going to be a no on the Tommy John for Ohtani. ← Rangers try an opener.